Subterranean moves by Mr. Ezebuwon Nyesom Wike, the governorship candidate of the Peoples Democratic Party, PDP, at the April 11 governorship election in Rivers State to jump ship and join All Progressives Congress, APC, have been uncovered and strongly condemned. Wike, who was declared winner of the governorship election by the Independent National Electoral Commission, INEC, received knocks for the moves which aim, it was uncovered, is to obtain the cover of APC and avoid a judicial dethronement. Wike’s latest move comes as no surprise to those who know his antecedents. Having back stabbed his mentors like former Senator John Mbata in the past and more recently Governor Chibuike Amaechi, he would only be living true to the unreliable ally that he has grown to be. 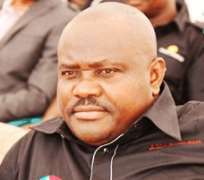 “Wike’s history is replete with sabotage and dual personality often unstable among peers. So, we are not surprised at his latest moves to dump PDP to join APC.. Such a move portrays him as unstable in relationship having at several instances, bitten the finger that fed him. .....He thinks that by hiding under the canopy of APC membership, elders of the APC will prevail on Dr. Dakuku Adol Peterside, the governorship candidate of the party at the April 11 election, to abandon his quest for justice”, Mr. Chris Finebone, APC Rivers State Publicity Secretary said. Giving insight into the plan, Finebone explained that Wike, as soon as he is received into the APC fold, will woo APC elders and leaders to prevail on Dr. Peterside to drop his quest for justice before the Election Petition Tribunal.